Risen from the ashes the city of Gaxmoor is now enjoying a renaissance. Count Gunshoffhas taken the city under his wing and has begun rebuilding it. To solidify his claims, he turned to other nobles, seeking their aid and vassalage with promises only he could offer. For with him stands Velparun, a stonemason of ancient lineage and singular abilities, one whose family hails from ancient Gaxmoor. Through him Gunshoff has promised to build a grand temple to both show his power to all and to have Velparun train master masons for each of those who support him. With this the locals flocked to join him and travel even now to Gaxmoor to sign with their signets. But Velparun has gone missing, kidnapped and hauled to the caverns far beneath Gaxmoor. All attempts to rescue him have failed and the Count now looks to outside help, professional adventurers to enter the caverns and rescue Velparun. But time is running out, for the nobles are in route, and if they feel as they have been duped by the Count then the only promise they’ll bring is the promise of war. Plunge into the undercaverns of Gaxmoor! Save the ambitions of a powerful man and rescue a mason of wondrous ability for the promised wealth, the song and the glory that all will remember for time without count! 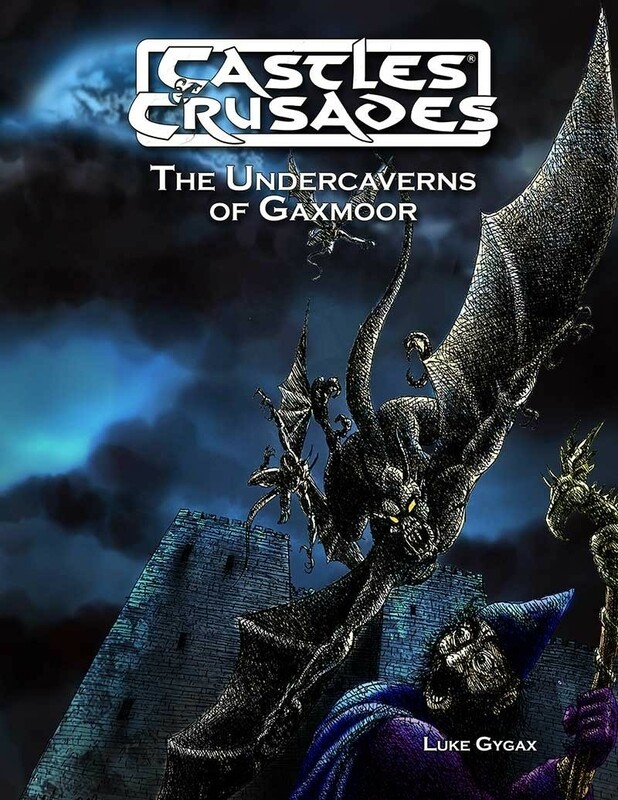 The Undercaverns of Gaxmoor is a stand-alone adventure for fantasy role-playing games. Although it is set in the Lost City of Gaxmoor in the World of Aihrde, it may be adapted for use in any setting desired with little effort on the CK’s part.